Although severe depression and bipolar disorder are readily recognized, it can be difficult to distinguish the milder (and more common) forms of depression from the emotional changes that are part of everyday life. Unlike most medical disorders, depression and bipolar disorder are not associated with any characteristic laboratory changes or microscopic tissue abnormalities that can be used to confirm a suspected diagnosis. The American Psychiatric Association has established diagnostic classification systems to allow consistent diagnoses of major depression, bipolar disorder, and the various forms of anxiety. These criteria are contained in the fourth edition of the Diagnostic and Statistical Manual of Mental Disorders (DSM). Some people who do not meet the DSM criteria for depression may suffer from a debilitating disorder known as atypical depression. o recurrent thoughts of death and suicide; suicide attempts. The diagnosis is more certain when these criteria are supplemented by either a family history of the disorder, a prior episode of depression or bipolar disorder, or the presence of a precipitating factor such as a recent stroke or the use of medications known to cause mood disorders. Other symptoms of depression include disorganized thinking and delusions. In addition to these disturbances in mood and cognition (thinking), patients with major depression may experience changes such as constipation or decreased sexual drive. Episodes of major depression range from mild to severe. In mild episodes, symptoms barely meet the requirements for a diagnosis and the associated functional impairment is minor. Severe episodes are characterized by several debilitating symptoms, including worsening mood and marked interference with social and job related functions. Severely afflicted individuals have difficulty with almost every activity-going to work, socializing, and even getting up in the morning. They may be unable to feed and dress themselves or to maintain personal hygiene. Patients with major depression are generally perceived as being sad or having a depressed mood, but sometimes they do not exhibit either the sadness or some of the other symptoms normally associated with the disorder. Although such cases are quite common, comprising 29% to 42% of depressed outpatients, this kind of depression is known as atypical depression. 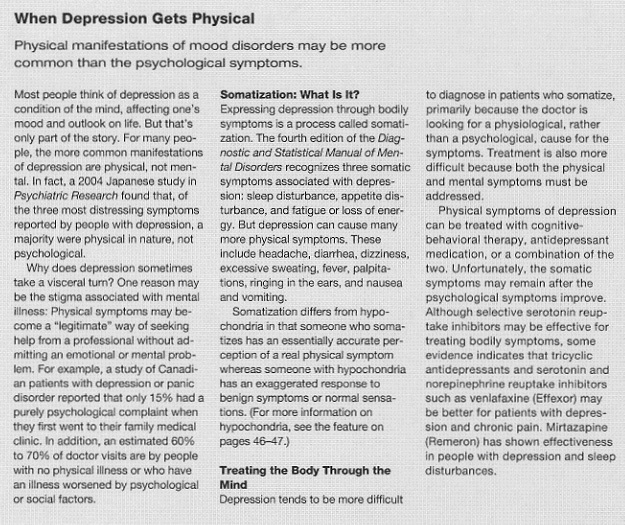 The disorder is just as debilitating as major depression despite the apparent lack of sadness. In fact, during a 13-year follow-up of 1,612 participants in one study, patients over age 50 who had atypical depression were significantly more likely to die than persons with major depression or no depression. Older individuals are less likely than younger individuals to report sadness as a primary symptom of depression. Suicide-the 11th leading cause of death in the United States-is a major complication of depression. About 1 in 16 people diagnosed with depression die by suicide, and two thirds of people who die by suicide are depressed. In the United States, the risk of suicide is highest in older white males and in those who live alone, have made prior suicide attempts, refuse psychiatric evaluation, or abuse alcohol or other drugs. Although women attempt suicide three to four times more often than men, men are three to four times more likely to die by suicide. In addition, a 2002 Swedish study found that older people with a serious physical illness were six times more likely to die by suicide than those without a serious illness. Up to three quarters of people who die by suicide have visited their medical doctor in the prior month. This suggests that these people were aware that something was wrong but that neither they nor their doctor identified depression as the problem. Although it is impossible to predict accurately who will attempt suicide, there are warning signs that a severely depressed person may make an attempt. 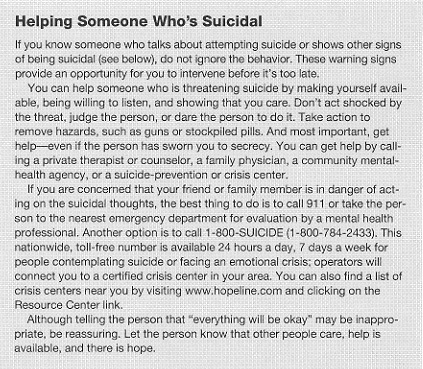 All too often, friends and family of people who die by suicide are unaware of the seriousness of the signs until it is too late. o family history of suicide or previous suicide attempts. Although increasing age alone does not put a person at greater risk for depression, the incidence of depression is higher in older adults. A survey of Californians age 50 to 95 found that factors such as chronic illness, physical disabilities, and social isolation-which often coincide with increasing age-were more predictive of depression than age itself. As a result, depression in older adults is a serious problem. The National Institute of Mental Health's Epidemiologic Catchment Area Study estimated that at least I million of the nation's 31 million people age 65 and older suffer from major depression, and an additional 5 million have depressive symptoms that are severe enough to require treatment. Unfortunately, the disease is often misdiagnosed and left untreated in the elderly. Many older persons who live alone have inadequate support mechanisms and are confused by the multitude of systems available to provide medical care, social services, and financial assistance for their medical needs. Older adults also tend to be embarrassed and reluctant to seek professional help for emotional problems, partly because the stigma of psychiatric illness is especially strong among people in this age group. In addition, friends and family often fail to perceive signs of distress. Older depressed patients are more likely to tell their primary care physician about physical complaints than about subjective feelings of depressed mood. For example, they may report loss of appetite, insomnia, lack of energy, or loss of interest and enjoyment in daily activities. Unfortunately, both doctor and patient often consider these symptoms a "normal part of aging" that accompanies the physical, social, and economic problems faced by many older adults. Depression is sometimes left undiagnosed because of life circumstances that are common in later years. The elderly are typically subjected to numerous stressful life situations: loss of a spouse, family members, or friends by death or geographic relocation; retirement, which may be accompanied by a loss of status and self-identity; diminished financial resources; fears of death or loss of independence and self-sufficiency; social isolation; and medical problems. Any of these factors may trigger symptoms of depression that are attributed to life stresses and not recognized as a true depressive illness. In addition, the higher prevalence of concurrent medical conditions and a greater use of medications in older people further complicate the diagnosis. Although the depression may be a primary disorder, it may also result from some underlying organic cause such as cancer, stroke, or a reaction to a prescription drug. The possibility of dementia adds further difficulties: Symptoms of major depression can mimic symptoms (for example, disorientation, distractibility, or memory loss) of a dementia-causing disease such as Alzheimer's disease. Thus, doctors need to perform a careful mental status evaluation as well as a medical history and physical exam to find the primary cause of the psychological symptoms. Mood disorders most often surface between ages 20 and 30, but they can occur at any age. There is often a delay in accurate diagnosis because symptoms are not recognized as being related to an illness but, rather, thought to be a reaction to life circumstances. The duration of an untreated episode of major depression is usually eight to nine months. This period can be shortened considerably with proper diagnosis and treatment. Most people with depression have their first episode before age 40, and most will have more than one episode in their lifetime. Relapse rates are lower in people who continue to take active treatments. Alcoholism can make recovery from depression and bipolar disorder more difficult. A recent study compared 176 men and women who fit the criteria for both alcoholism and major depression with 412 people who had major depression alone. Subjects who had never been alcoholics or who no longer drank were two times more likely to recover from an episode of major depression than the active alcoholics. Unfortunately, many depressed people slow their recovery by attempting to self-medicate with alcohol.